The 2018 Chevrolet Impala V6, starting at $28,770, has changed significantly over the years, yet somehow remains just the way it always was. The Impala’s popularity and legend began in 1958 when it was originally coined as a Chevrolet nameplate. What began as a Bel Air sub-brand quickly turned into a separate model in only one year. The debut model was available in coupe or convertible, but eventually expanded to include sedans. Since then, the model has undergone a few minor changes while forwarding the sedan status. Regardless of changes, the 2018 Impala is a reflection of its ancestor, both physically and internally. The original Impala was body on frame, dissimilar to the current model, which, like all contemporary vehicles, is unibody. The current Impala is front-wheel drive, unlike the original. The list goes on, as there are many differences between new and old. Size wise, the original Impala was much larger, even though today’s car is considered a full-size sedan. The new version is 201.3 inches long on a 111.7-inch wheelbase, while the overall length of the ’61 coupe, sedan or convertible was 209.3 inches long with a 119.0-inch wheelbase. The original Impala was known for a lot of room inside with most models accommodating six passengers. The original seats are incomparable to the new model, as the contemporary model offers lateral support, adjustability and upholstery. The 2018 model features electrically assisted rack-and-pinion power steering systems, a significant change from the original hydraulic recirculating-ball setups of the past. Although the newer Impala is a bit heavy then the original, mainly due to crash-testing standards, among other contributors, the current model is much quicker in varying length sprints. The results can be attributed to a modern computer-controlled six-speed automatic. Like its ancient ancestor, it ranks at the top of the sales charts in the full-size-sedan class. Chevy’s longest running sedan offers unrivaled value, even as today’s market is generally shifting toward SUVs and other similar models. 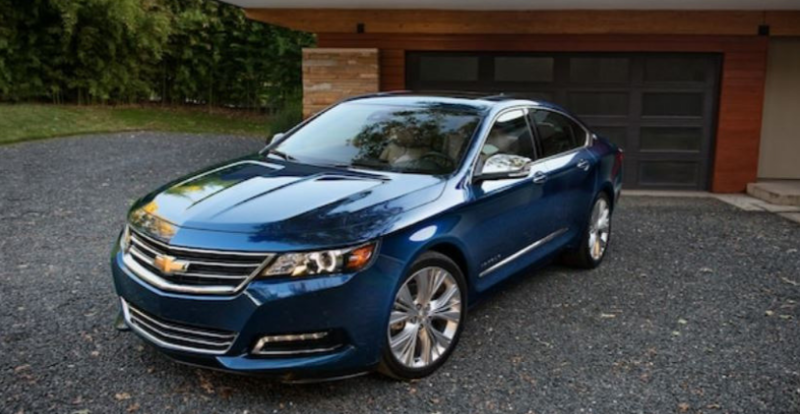 But SUV buyers should recognize the strong resale value and reliability ratings of the Chevrolet Impala and reconsider their stance in the marketplace. The 2018 Chevrolet Impala sees a number of package and option changes, although the basic model stays intact. The LS trim receives leatherette and cloth seats, a MyLink radio with 8-inch touchscreen, keyless access with a push-button start and a rear backup camera. The LT model gains remote starts, while the Premiere adds navigation, Bose audio and wireless cell phone charging. For more information regarding the 2018 Chevrolet Impala or any 2018 or 2019 Chevy Models, visit the Tinley Park Chevy Dealer in person or online. Our friendly and helpful staff is always available to assist! Ever cooked anything ON a car?